i even don't mind using some dirty tricks, if there are any ;p.
Not sure I understand this question but why do you say you get "nastily looking corners" when using circular-shaped window? Using alpha channel transparency your windows can have any shape you like and there should be no nastily looking corners or there's something wrong. Have you checked out the AlphaApple example that is shipped with Hollywood? If you mean by "nastily looking corners" the OS window borders, those can be hidden by using "Borderless" window. Or if you get black background instead of transparent area on "corners" around the circular clock image, then you are running the program on a screen which doesn't support alpha transparency. For example, on Amiga compatible systems you need to have 32bit screen with compositing mode turned on. I have no idea about other platforms though... but if this is your problem, you can do some kind of dirty software hack to get it look transparent. 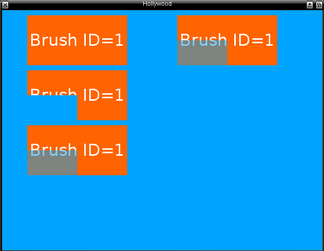 ; and run it on a suitable screen mode (32bit and hw accelerated). ; If you move the window or other windows beneath it, everything should update automatically. ; Let's grab the underlying area of the screen by hiding our window first. ; and you might want to check if window has moved/resized and draw it again then etc. My apologies for long delay and not being more specific in asking questions. Generally speaking, I was wondering if i can make background of my app 100% transparent when running it on WB's screen. jPV answered already, and it works well, thanks a lot, but i have more questions. lets say with TextOut(), is there anyway to make background 100% transparent and dipslay text only without any bg picture? switch composition on. But how it's going to look in Morphos and AROS, or even windows, macosx? Next case, i want to make some kind of glow effect around object, text or/and brush, that blends nicely in WB's screen. How to achieve that, is it possible at all? picture has an irregular shape with transparent pixels around it and i need 50 pixels transparent 'frame' around it. I hope i've expressed my needs more precise ths time. Regarding software hack version. Would it work on AOS3.x with Planamarama plugin? And how to make it 'flush' background every set amount of time in most efficient way? I mean how often should i clear background and what functions/loops use for it. Thank you very much for you help so far and ask for more ; ). I haven't found a way to render something directly over transparent bgpic, but you can first create an alpha transparent brush and then draw the text into the brush (SelectBrush with a suitable combo mode), and then use that brush as a new bgpic (BrushToBGPic). Then you can have your text or other graphics over a transparent display. Actually, I think that constantly updating program (clock) is harder to make with hardware compositing mode, because if you do it like I said above (BrushToBGPic), you are likely to see glitches when the bgpic gets changed. So it doesn't look good when updated once per second or not even once per minute. But if you use software rendering hack mentioned in previous posts, then you can have screengrab as the bgpic and draw other things over it normally. I think that would work well, but the downside is of course if you want to move the window, it will need manual re-drawing then. That's easy with the previously mentioned ways. Create a brush with size 200x200 (make it transparent or use screengrab depending if doing hw or sw rendering), render your own 100x100 background with glow effects you want in the middle of it, and use the result as a new bgpic. I've used this method in my RNOWidgets program when creating automatic drop shadows for widgets. If you have access to a MorphOS machine, have a test run with it. You can enable/disable compositing mode and enable/disable dropshadows from the settings etc. Here is one image where you can see the shadows in action. I still haven't had time to check the plugin and have no idea how it works, but why not? I wouldn't like to do it time based, because most of the updates would be unnecessary, and when you have moved the window, updating wouldn't probably hit in the right time either. I made it (in RNOWidgets) so that background is refreshed only when window gets deactivated and it has been moved (user has moved the window and then clicks somewhere else and our window gets deactivated). I do it by installing InactiveWindow and MoveWindow event handlers, and in move window function I only set a variable which tells if the window has been moved, if it hasn't it's useless to re-draw the background. Then the inactive window function re-draws the background only if the move variable is set. Firstly i want to express my admiration for your RNOWidgets, wow, looks amazing . Secondly thanks for your help, it's nice to get advice from someone experienced, you answers are simple and easy to understand. But there we go again, more questions ; ). I was wondering if there is a function (didn't find one myself) that makes possible to mask object with transparent brush (100% or less transparency, depending on needs), so everyting covered with it becomes invisible or partialy translucent? If not, that would be nice feature to have in Hollywood, little request to Andreas; ). Another unrelated question. We can rotate objects around Z axis, is there a way to rotate things round the X and Y to add some kind of depth and 3D transformation? jPV wrote: I haven't found a way to render something directly over transparent bgpic, but you can first create an alpha transparent brush and then draw the text into the brush (SelectBrush with a suitable combo mode), and then use that brush as a new bgpic (BrushToBGPic). Then you can have your text or other graphics over a transparent display. I thought as well about using 99% transparent brush. But most likely your way is better. of Hollywood, to make sure i don't make silly mistakes later on. Is there any reason why i should want to use software rendering rather than hardware? Is H/W method much more demanding for cpu/gpu? Or it's better because some people do not enable h/w compositing in their system, thus app is more universal? But what in case user does not activate window and moves something over it and then clicks on depth gadget to send it to the back? Grabbed part of the window gonna be visible over it? Is there any event handler that checks for such eventuality? Ferin wrote: Firstly i want to express my admiration for your RNOWidgets, wow, looks amazing . I think SelectAlphaChannel or SelectBrush do all you need? Hmm.. not that I remember. That could be really nice and useful actually. If there isn't, this should be a feature request then! If we are still talking about a clock program where everything else would be transparent except the numbers, you need to update the transparent background image with new numbers at least every minute. And changing the bgpic makes the window reinitialize and that makes a visible "glitch". Dragging the window around etc is of course pretty and you don't have to do anything for it, but if you still have to update the transparent content of your program, that causes a problem. That's why I don't have fully transparent (transparency under the numbers/hands) clock in RNOWidgets, but I have fully transparent calendar, because it doesn't have to update itself periodically I just have static (but still transparent on edges) bgpics with clocks. But if anyone figures out a solution for this, please tell me too! jPV wrote: I think SelectAlphaChannel or SelectBrush do all you need? Thanks jPV, i have to try if they would do the job. Basicaly i want to make green brush called "MASK" to make orange brush with ID=1 invisible everywhere it is covered. Of course MASK brush is not visible (it's only here to illustrate the principle). Ideally would be nice to be able to assign as many IDs as required, so green MASK brush "covers" all of them with invisibility (full or partial) leaving everything else in tact. I don't think it's possible at the moment but i may be wrong. Another thing I'm struggling with is drawing single straight line with LineTo() function. Whatever i try it says "Can't draw an empty path!" If i add more LineTo()s it does not say anything but does not draw anything either. Adding AddBoxToPath makes draw box but not lines?! And last thing, when i use PathToBrush it says it needs at least one argument in the table? I wanted to turn a single path into a brush and then rasterize it, but it seems that i have to pass two path IDs to this function or am i doing something wrong? Generally i want to create vector text with AddTextToPath() => turn it to brush => modify brush with PerspectiveDistortBrush() => display both - original and distorted at the same time. I know there is simple solution to that, but i can not find it. ; Let's revert to our original brush. Of course other brushes could be used too. But that only works if you render the "mask" to each brush individially, and maybe do some calculations for positions if they have to be somehow connected. Which looks exactly the same as the previous example.